In a field as disorderly as barbecue, numbers bring a certain comfort. Perhaps that explains the popularity of the 3-2-1 method for cooking ribs. I tried the method again a few nights ago and understand its appeal. The process gives you meat so tender it virtually slides off the bone, with the multiple layers of flavor most of us associate with great barbecue. And within a predictable 6-hour time frame, too. It’s relatively fail-proof, meaning that if you follow the directions, you are almost guaranteed you’ll avoid the dual pitfalls of ribs that are tough or dry. And if you serve ribs cooked by the 3-2-1 method, 95 percent of the people who taste them react with delight and will declare you a barbecue genius. My guests sure did, and I did not deflect their praise. And yet … and yet … I felt a certain unease accepting their compliments. These were good ribs—very good ribs. These were easy ribs. Safe ribs. 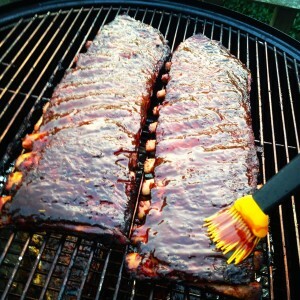 These were ribs almost anyone could love on account of their moistness and tenderness. But they weren’t hall of fame ribs—ribs with character, with soul—ribs that test a smoke master’s mettle and declare victory in the heroic battle to balance smoke, spice, heat, and time to transform tough connective tissue into meat equally remarkable for its tenderness and complex flavor. They suffered from a transgression I have consistently condemned in all my books: boiling. For when you wrap and cook ribs in foil, you are, in effect, boiling them in their own juices. (The heat in your smoker can exceed the 212 degrees required to boil water at sea level.) Hence the almost supernatural tenderness coupled with what you could call a faintly washed-out flavor. With ribs, there’s a fine line between tender and mushy. True rib connoisseurs (and Kansas City Barbecue Society-trained judges) prefer their rib meat with a bit of chew, a perceptible bit of resistance. We are unimpressed whenever ribs practically debone themselves at the first tug of the teeth. 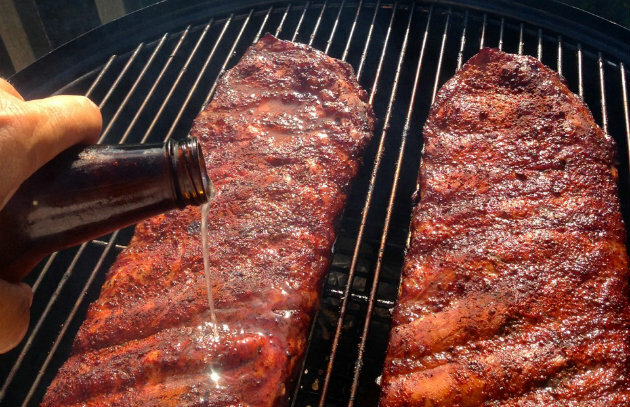 And the moist environment in the foil softens the bark—the smoky, crusty exterior of the ribs highly prized by pit masters. Bottom line? Most people will love ribs cooked by the 3-2-1 method. Purists like myself remain skeptical. Form your own conclusions by doing a side-by-side comparison. Please post your results and photos on the Barbecue Board and on our Facebook pages (Barbecue Bible and Steven Raichlen). 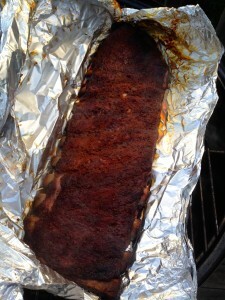 Click here for recipes and techniques for ribs in a hurry.